During our years here at SlideDog, we have collected a few tips and tricks on how to make sure your PC behaves properly during a presentation. Now, we would like to pass this knowledge on to our beloved SlideDog users! This guide is optimized for Windows 8, but you should be able to adapt the steps to any Windows operating system. You do not want your PC screen to go black in the middle of your presentation. To prevent this, click “Change Plan Settings” and make sure all rows are set to “Never” in the “Plugged in” Column. Inserting USB sticks and adjusting the system volume makes these beeping sounds by default. Also, a Screen Saver can be quite annoying if the PC is left inactive during the presentation. 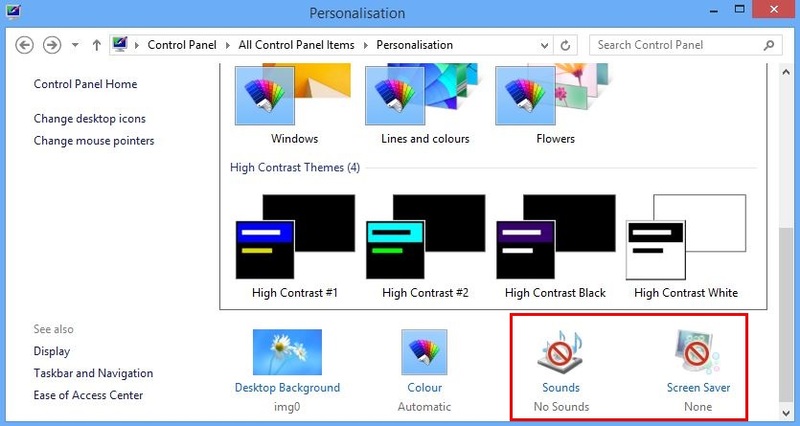 Make sure Screen Saver is set to “None” and Sounds is set to “No Sounds”. In case you are forced to minimize SlideDog in front of your audience, it will look much better if you change your Desktop Background to either your SlideDog background image, or just a solid black color. 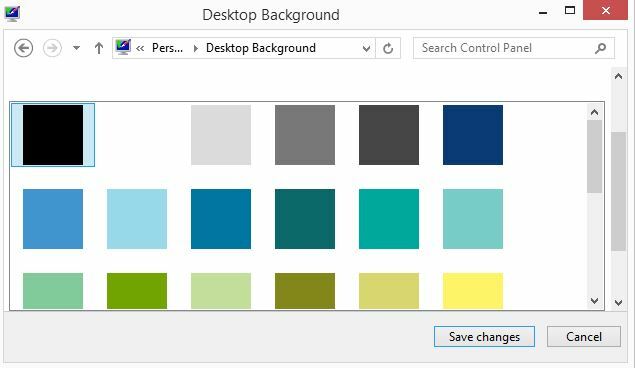 Select Desktop Background and “Solid Colors” from the dropdown list. Then select the black background. Your PC should not bother you with updates during an important presentation. 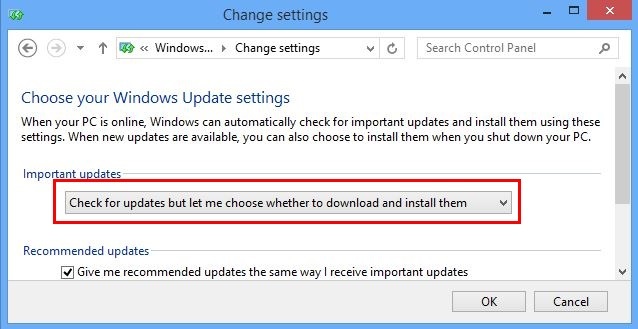 Click “Change Settings” and select “Check for updates but let me choose whether to download and install them” from the dropdown menu. 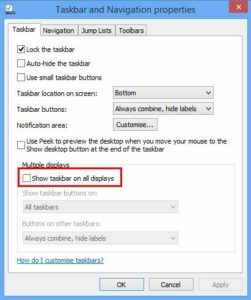 If your are using Extended Desktop mode (SlideDog in Dual Screen mode), it will look more professional if your audience does not see your taskbar on the big screen. Right click on your taskbar (the bottom blue bar on your screen) and select “Properties”. 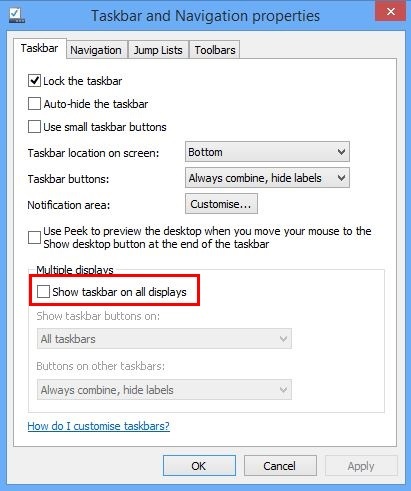 Disable “Show taskbar on all displays”. Depending on the PC model, accidently swiping with one, two or three fingers can have unwanted effects (such as launching the Windows App store). If you are not 100% confident with your trackpad gestures it is recommended to turn them off. This varies from PC model to PC model, so this guide will not pursuit this any further (Your best bet is to look for something with Trackpads in the Control Panel). If you are unsure on how to do this, you can always connect an external mouse during the presentation. During your presentation, it is important to have as little programs running as possible (Dropbox might start downloading a large file added to a shared folder, someone might call you on skype etc.). 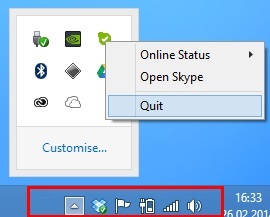 Turn off applications you do not need by right clicking on them in the bottom right task bar and select “Quit”.